Syed Majid Ali is a fellow member of the Institute of Chartered Accountants of Pakistan, presently working as Chief Financial Officer at Faysal Bank Limited. 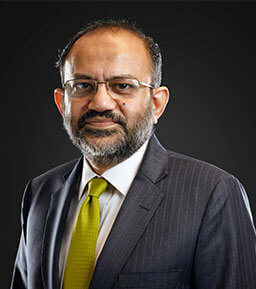 Prior to this position, he has served as Chief Financial Officer at Saudi Pak Commercial Bank Limited (now Silk Bank Limited) and Emirates Bank International PJSC (Pakistan operations). He has also served as a Partner in KPMG Taseer Hadi & Co, Chartered Accountants. Mr. Ali has rich experience in banking mergers and acquisitions (M&A). He was the member of the core team responsible for the sale of Emirates Bank International PJSC (Pakistan Operations) and Saudi Pak Commercial Bank Limited. He was also actively involved in the acquisition of RBS Pakistan operations by the Faysal Bank Limited and its subsequent integration. In addition to Accounting & Finance, he has gained rich experience in the areas of Strategy, Human Resources and Technology. He has supervised Strategy, Technology and Administration functions at Faysal Bank Limited. He is member of the Accounting and Taxation Committees of the Pakistan Banks’ Association (PBA), Overseas Investors’ Chamber of Commerce and Industry (OICCI), and Pakistan Business Council. He is also a member of the Income Tax Bar Association, Karachi.